We may have invented mobile phones but they rule over us! Cell and smartphones are literally everywhere. It is estimated that every nine in ten Americans has a cell phone and that more than 50% of those devices are smartphones. We have to understand that cell phones are ubiquitous. They are here to stay. And, as a marketer, this is actually a very good thing. With cell phones and their apps getting very friendly and smart, thanks to their constant redevelopment, the opportunities are endless for either small or medium-scale businesses, particularly in the Americas. Your company’s marketing strategy should depend upon, or at least favour, mobile marketing. If you still haven’t considered this, then you are already lagging behind your rivals. The plan is to use the mobile marketing traits to leverage and accelerate the growth of your business. Today, we are going to discuss some of the effective ways and uses of m-marketing strategies that can essentially provide growth and prosperity to your business. If you want your mobile marketing dream to work, you have to develop a standalone app for your business. Your app should have all of the features that your clients would need as well as to serve to all your purposes as well. The application is easy to use for both you and your customers. Customers can access all of the features that you provide, not just a few or some of them. Customers should be given the chance to order directly from the app if the company is directly involved in the selling of goods or services. Eventually, the application should save time and make the whole process simpler and easier. Just remember, m-marketing can provide users with data according to their location, geography and time zone. Hence, the whole strategy can be personalized and customized. With a good mobile app, marketers can easily promote their offers and products as per the geographical location of the users. This process is known as geo-fencing or geo location-based advertising. This can only be possible if your company has an app with good enough software. For example, Uber currently uses geo location of your cell to provide you with taxi offers and deals for that particular area/city. So long as you develop a good application for your strategies, the possibilities are endless. There is no point in running a huge marketing camping and targeting ever single soul on the face of the earth. It is time-wasting, expensive, and needlessly to say, illogical. This is why it is vital that you must know your audience. M-marketing gives you the power to reach targeted audiences and you must use this for the growth of your business. A cell phone is generally-owned by one singular person, at all times. Thus, this is your chance to exploit that. If you have the right knowledge of your target audience, then you can easily reach out to them by using your marketing campaigns and messages in real time. This way, you’d easily make the most of your m-marketing plan and you will tap into potential markets better. Your mobile marketing strategy should derive some value as well as to provide something to your customers. This way, you’d boost up your business and drive sales. A text marketing plan, which promotes a new product or service, would certainly excite your customers and your audience. Along with the text, you must also provide an additional incentive. This will make the message “of value” to the customer. For example, an app alert stating that this particular coupon code can yield customers with a 20% discount on their next purchase. This is a very common use of m- marketing and it allows the companies to truly understand whether their plan is working or not. It also gives customers the incentive that they dearly look for. The m-marketing plan will yield results if you present your case diligently. It will also enhance your brand’s reputation. Also, astonishingly, 70% of customers check and compare their prices using their cell phones, even when they are in the stores. Thus, even at the last point, customers look for good value and deals at online stores, as they expect it. Phone users search the internet for any data or information in a very different way. Users on handheld devices are very robust and most times they are using the cell phone because they are on the run or are in need of some quick information. Hence, whenever you make nm-marketing plan, you must segregate the mobiles from the computers. With U.S. audience spending nearly 3 hours a day on cell phones, marketers have a huge pool to tap into. Thus, it is vital that companies take cell phone use seriously and separately. Additionally, companies have to make sure that the information on devices is easy to grasp and see, as users on hand-held devices don’t have the patience to scroll or click frantically. With people using cell phones regularly, it is vital that companies take mobile phone usage seriously first to make the m-marketing program work. To be certain whether your website is doing well or not, you can use tools like Marketing Grader. Besides, you can also use interactive ways to promote and make your m-page interesting. Finally, you can also explore the option of app-only service. Many products and companies have successfully flirted with mobile-only strategies before. Mobile Marketing is a very tricky domain to master. There are many losses if you get it wrong; however, the profits are high if you get it right. We are sure that following these tips and pointers will certainly help you to make up your mind. Sawaram Suthar is self-motivated digital marketing consultant and growth hackers. 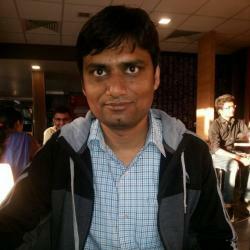 He is founder at Jagat Media - a digital marketing agency and marketing head at Tagove live chat. He helps small & medium and big enterprises to increase their ROI and overall business.